The muscles which flex the elbow are the bicep complex. Like all musculoskeletal units, the end connection is a tendon composed of strong, sinewy fibrous tissue. The long head of the biceps is located in the midportion of the front of the arm. Bicep tears occur most commonly in the shoulder and often require no treatment. Less commonly, the long head of the bicep tears at the elbow. These tears cause weakness both in elbow flexion, but more importantly in turning the palm up. Patients notice this weakness in turning a door knob or working a screwdriver. Bicep tears at the elbow occur much more commonly in men rather than women. 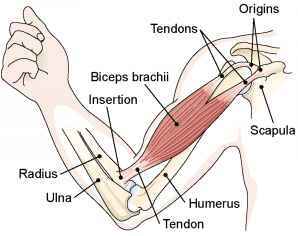 Weakness after a tear at the elbow persists because the tendon retracts due to the muscular contraction. This results in the tendon scarring into a non-anatomic position resulting in permanent weakness. The long head of the bicep provides approximately 15% of elbow bending power—so many patients will not notice this change. However, it deploys approximately 50% of the power to turn the palm up and most patients will demonstrate a functional deficit. Because of this loss in power in turning the palm up, most patents will opt for surgical management. Surgical management can restore power both for elbow flexion and turning the palm up. The bicep muscle is one of few muscles that span two joints. The muscle originates above the shoulder and inserts into the tuberosity of the radius. The biceps muscle has two tendons that attach the muscle to the shoulder and one tendon that attaches at the elbow. The long head of the bicep origin and insertion is shown above. Most bicep tears are complete. Although there is some controversy, the current trend in partial tears is toward surgical management. These partial tears are thought to progress to complete tears. In complete tears, the tendon ruptures away from the radial tuberosity and retracts. This gap will not fill in and the tendon remains permanently detached from the radial tuberosity. A typical bicep rupture at the terminal insertion into the radial tuberosity. Most patients present with pain and deformity of the elbow. Most patients have significant bruising of the arm. Patients may report that they felt the tendon tear at the time of injury. 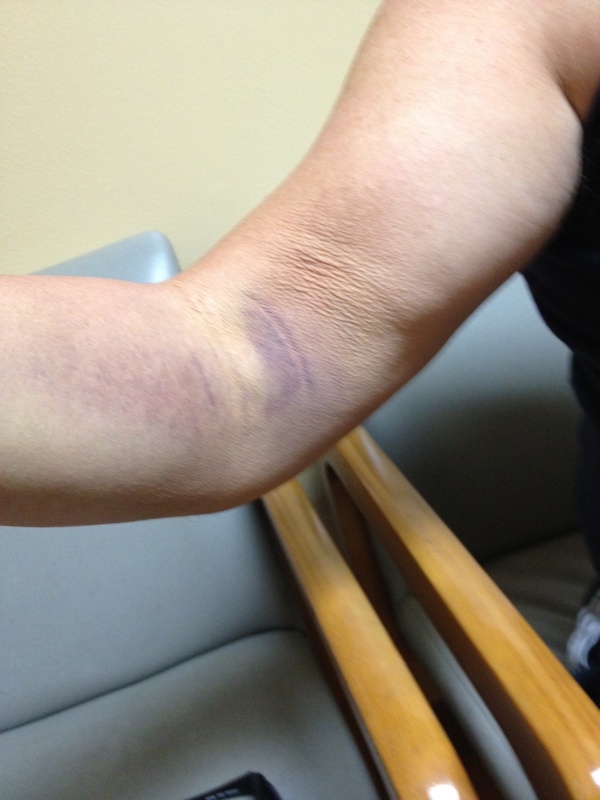 A right elbow distal bicep tear demonstrating bruising and swelling. Also note the bicep appears to be closer to the shoulder than in a normal elbow due to the contraction of the muscle. After taking a complete history, your orthopedic surgeon sill evaluate your arm. An examination centers on range of motion of the shoulder and elbow—also the status of the associated nerves and arteries. The surgeon will note the deformities present and signs of bruising. 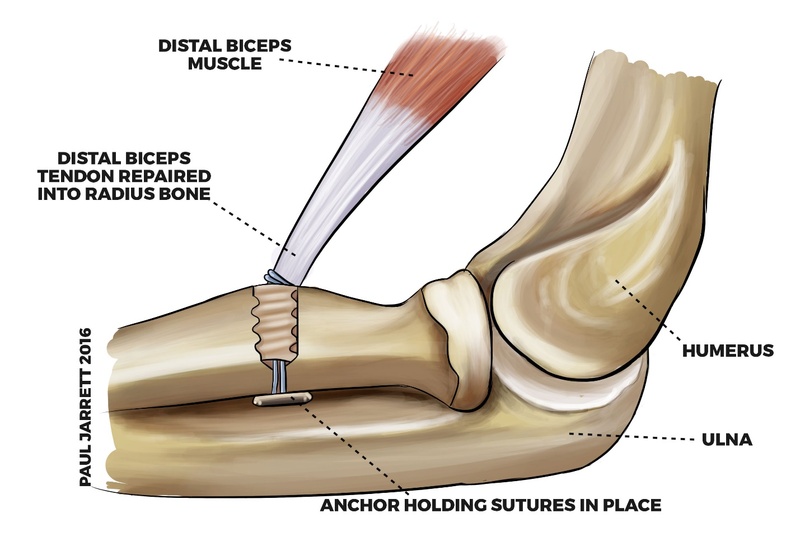 The surgeon may palpate to determine if there is a gap in the distal bicep tendon. This is also called a “hook sign.” Strength testing of the arm may reveal significant difficulties with turning the palm up (supination). In some cases the surgeon may order additional testing. Routine x-rays do not image the tendon, but may real additional injuries to the bone (fractures) or dislocations/subluxations at the elbow. Advanced imaging studies would include either ultrasound or an MRI. Ultrasound utilizes sound waves to render an image of the tendon and can often be performed in the physician office. An MRI utilizes magnetic waves to image the tissues an can render a more complete imaging study of the entire elbow. Non-surgical treatment is typically reserved for patients felt to be till ill or not require restoration of elbow power (e.g. older or non-dominant arm). Nonsurgical treatment results in an elbow with good motion, but the deficits in elbow power persist—both in flexion and supination. Because of these limitations, few patients choose this option. Surgical Treatment is aimed at restoring anatomy and function. Surgery reattaches the tendon back to the radial tuberosity. 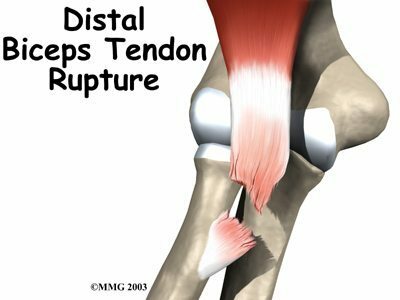 When performed within the first two weeks after injury, typically the tendon can be reattached direction without the need for a graft. 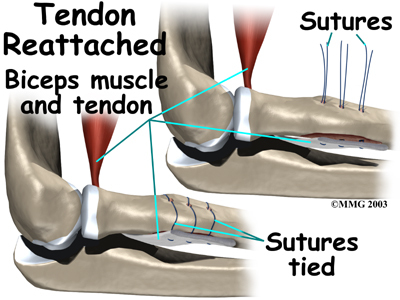 The surgery to reattach the tendon may be performed with a single incision or with two incisions. Both techniques have shown equivalent results. This surgery is typically perfumed as an outpatient and does not require general anesthesia. Two incision technique utilizing sutures around the radial tuberosity. The tendon may be reattached with either sutures or anchors to the radial tuberosity. If the treatment is delayed, the gap between the tendon and bone may be large enough to require a tendon graft. This graft may be harvested from the patient or a tissue bank. Typically a period of immobilization in a sling for comfort. Once the patient is comfortable, work begins on restoring range of motion for the elbow. Once motion has been reestablished, the focus then turns to restoring strength. Even under the most positive circumstances, per permanent loss of flexion and supination strength is to be expected. After surgery the patients arm is typically immobilized in a splint with the elbow bent for approximately two weeks. The patient returns to the office and sutures are removed and gentle elbow motion is begun. At six weeks after surgery, more aggressive range of motion is instituted, particularly with regaining supination. At ten weeks after surgery a gentle strengthening program is begun. Therapy may be done at home or under the direction of a physical therapist. Tendon typically takes approximately sixteen weeks to heal and is still gaining additional strength for the first six months. Typically patients are restricted from heavy lifting until six months post-surgery and can expect continued incremental gains up to one year after management. 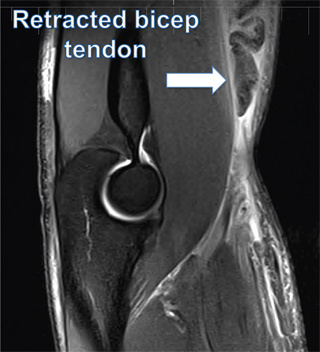 Distal bicep tendon tears are uncommon, but with modern surgical techniques good outcomes for patients are reported with surgical management.